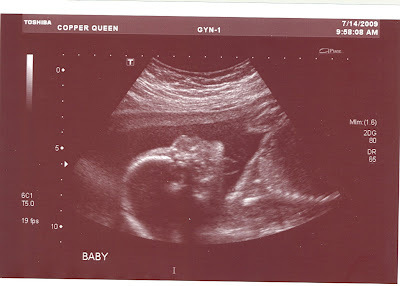 Ok, so I was totally thrilled to have been given one more chance to see our baby!! To be honest, I am scared to death! For those that really know me, know how much I am in love with Grant. He is just means the world to me, and the thought that I would have another one, scares me. My older sister asked me if I felt like I couldn't love this one as much as I love Grant... Truth be known, that yeah there was that fear. Only because Grant is here, and Cami is not. BUT seeing Cami today on the screen made me so excited to have her here!! So I thought I would share these pictures!!! This one she was waving to us!! She had her little hand up by her face moving it. The picture was SO much better than at the other place!! The guy was very sweet and wanted me to see everything. I loved it! I wish Mark had been here with me! You can tell that she is putting some weight on. She was all over the place. She is breech right now, which doesn't matter, because she'll be delivered via c-section. Our little Cami is a lady already! She had her legs crossed. 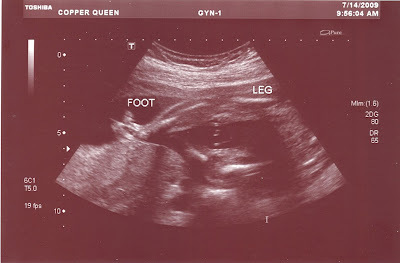 The ultra-sound tech said it didn't matter, because it was like she was sitting on an invisible chair, and we could see clearly that there was no male anatomy. So stinkin' sweet!! I honestly can NOT wait for her to get here!! Mark is so cute about it, and wants to fill her move at night. I have such a wonderful family, and it's only getting better!! I can promise you that you will love this baby just as much as Grant. It is an amazing thing! 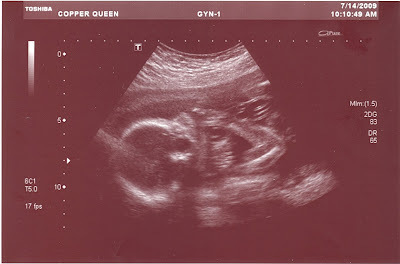 I still cannot believe you are having another baby. You were supposed to wait for me, remember?! Anyway, I am excited for you, she will be such a doll!! You will for sure love her as much as Grant. I had that exact same fear. Issak was my only one for almost 4 years and I couldn't imagine loving another as much as I love him... But I do, and you will to! Im so excited for you to have her and to see her. 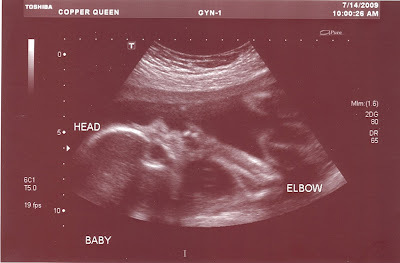 she is going to be such a beautiful baby! Cami is a very sweet name. I'm sure she will be a real cutie. Not quite sure how it works, but love multiplies not divides. It is definitely normal to wonder if you could possibly love more. . . but somehow you do! I wondered with all 5 of my kids--I found it strange that I knew I would love each one especially by #5, but I still wondered!! Seems kind of silly, but it is a very real feeling. You'll surprise yourself and things will turn out wonderfully.